In order to better devote my energies to business and family life, I've decided to step aside in my role as Manufacturers' Cup Announcer and MC. The article link below tells the story. The five weeks a year I was devoting to this series were amazingly enjoyable, but I now look very forward to using that time in a way which better benefits business and personal goals. This move will free us up tremendously where Slingshots are concerned, empowering more product development, more racing, more customer service, and more Slingshot event attendance. Many of you have already seen the beginning of this transition, as we've been considerably more active in this market as of late. To that end, we've also begun to obsoletize more Hahn RaceCraft products for other vehicles. These have reached the end of their product cycle life, and shedding them empowers even more capacity for more things Sling. Thank you all for your support, and looking forward to seeing you out there on the Slingshot Trail! Below, I'm interviewing one of my lifelong heroes, none other than "Spiderman" Larry McBride, 15-time Top Fuel Bike champion and the quickest and fastest dragbike racer in the Solar System: 5.61 seconds @ 258 MPH! What can we say Bill? You've reached levels of success in multiple areas quite well. You're getting the first turbocharged slingshot in the country running on the street was the starting point. You also had the first slingshot to have 200 rwh, 250 rwh, 300 rwh. 365 rwh - well, you get the picture. Slingshot NEEDS you and YOU need slingshot. In the past, (in my opinion only) you're talents were being pulled in many directions, and as a result, there were many areas that needed improvement. Now that you have eliminated the announcing and related travel, all that time and energy can and will be directed to the slingshot. I'm sure your pending relocation to Daytona will also add that extra jolt and raise your exposure to entry level slingshot owners. Your group buys and extremely reduced shipping times is just the start. Now that you'll be bringing powder coating in house, delivery times will improve even more. When products expand, costs are competitive, delivery times are shortened and communications improve, success won't be far behind. While one faction of motorcycles will miss you, the slingshot community is glad you made the right decision. Appreciate the vote of confidence, and you're absolutely right. It was time to simplify, and if you can all pardon a morbid analogy...to amputate a limb in favor of the remaining whole, so that it may survive and thrive. You putting it this way got me to thinking. 30 years ago in 1988, I founded Hahn RaceCraft as a part-time venture. I was still working for someone else, and would not attain full-time self-employment until I quit my last job and took the plunge in 1990. By that time, I was working three worlds: my job, my side-business, and my racing career. Things had advanced to the point where I knew I had begun to slide at all three, not able to do my best work...and I concluded that one had to go. Fortunately for me, my growing baby business had the strength to pull me through, and giving up my full-time job was the key to making it thrive. Now I could attain full power without wobbling! In many ways, this is a similar juncture, and I'm having to again make those hard decisions about what will stay, and what will go. And similarly, I expect that what remains will benefit tremendously from the increased focus. I'm as inspired as I've been in years, and thanks to my long career, I've never been more experienced or capable than I am today. With a clearer focus, and the bonus of more time to lavish upon my art, the sky's the limit! Edited once, last by Bill from Hahn RaceCraft ( Feb 10th 2018 ). I'm sure it was a hard decision... But I'm excited to see what the future holds for the Slingshot and Hahn RaceCraft! And everything Phil states, sounds very good for business... Is he the VP or something? It is very exciting to see you back posting and turning your full attention to what you do best - making things go fast. 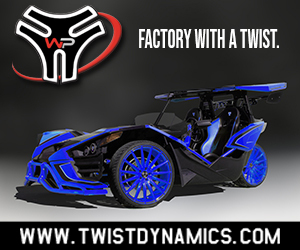 I have full confidence you will be cranking out the fastest slingshots with some of the most innovative new goodies. I think it is the right decision, family and business (to support family) are first and second. all the best.